Mennonites in Canada is the definitive history of the Mennonite experience in Canada, spanning a period of nearly two centuries. The Mennonite Historical Society of Canada is making these books available at a major discount. Buy them today for your personal library or for a book lover in your life, individually or as a three-volume set. 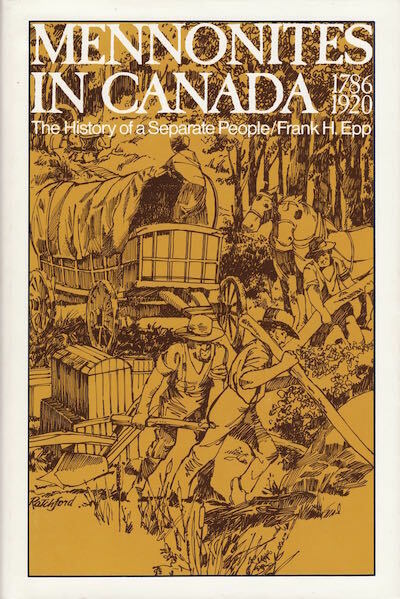 Mennonites in Canada, 1786-1920: The History of a Separate People, by Frank H. Epp. Toronto: Macmillan, 1974. Hardcover, 480 pp. Volume 1 traces the long and arduous search for a Mennonite identity, from the origins of Anabaptism in the religious and social ferment of 16th-century Europe, through the pioneering days in British North America, to the crucial point in 1920 when Mennonites were legally barred from entry into Canada. The book portrays the struggles of Canadian Mennonites as they sought to maintain a separate community and way of life in the face of assimilationist pressures and voices from within demanding renewal and reform. Internal disputes resulted in fragmentation, driving some toward further withdrawal from society and others toward accommodation. Volume 1 is now sold out. Used copies can still be found at a number of online booksellers. 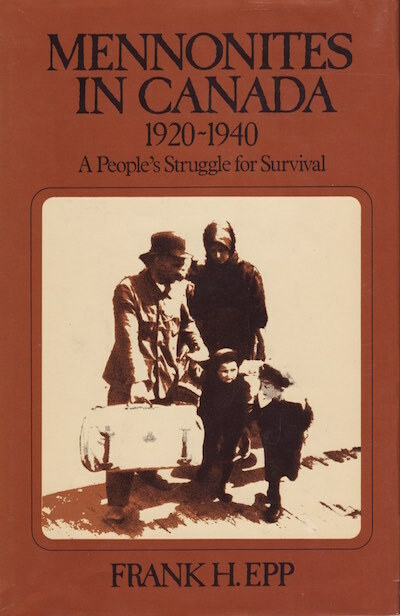 Mennonites in Canada, 1920-1940: A People’s Struggle for Survival, by Frank H. Epp. Toronto: Macmillan, 1982. Hardcover, 640 pp. The years covered by Volume 2 were a critical period when Mennonite survival in Canada was under a variety of external threats, and divisions continued to fragment Mennonite communities. The battle for separate schooling led to a significant emigration to Latin America, and a second wave of Mennonite immigration came from Russia. The book also covers the impact of the Depression on the Mennonites and their efforts to preserve their identity amidst pressures of assimilation. The books ends with the response of the Mennonites to the outbreak of the Second World War. 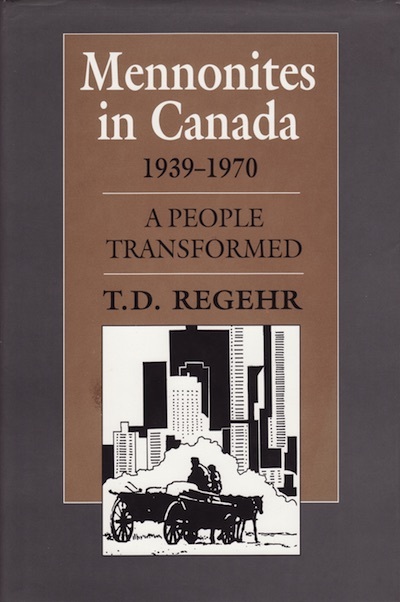 Mennonites in Canada, 1939-1970: A People Transformed, by T. D. Regehr. Toronto: University of Toronto Press, 1996. Hardcover, 563 pp. This third and final volume shows how the Second World War challenged Mennonites’ pacifist views, initiated the urbanization process, and brought in its wake a new wave of Mennonite immigrants from Europe. The author demonstrates how the shift from a rural to an urban society produced new vocations and new values that were often at odds with traditional ones, and profoundly affected community and church life. Institutional analysis is balanced with insights into the lives of ordinary people, who were in the end “transformed” but not assimilated. We have sold out of volume 1, but many copies of volumes 2 and 3 remain. Click the button below to place an order for shipment within Canada, or for pick-up from the Centre for Mennonite Brethren Studies in Winnipeg, at the bargain prices listed above. For shipment outside of Canada, and for other enquiries, please email cmbs@mbchurches.ca. Mennonites in Canada was commissioned by the Mennonite Historical Society of Canada. Publication was made possible through grants from the Mennonite Central Committee (Canada), the Government of Canada, several Mennonite church conferences, and private donors.